The madness has begun. On Sunday, Skylanders Giants was released in game and toy stores around the country. Parents waited outside on the brisk fall morning to be the first in line to get their hands on the new Skylanders Giants game as well as the horde of new figures released. After the shortages of various figures with Skylanders: Spyro’s Adventure it is no surprise that parents and collector’s alike flocked to stores so not to miss out on the latest line of Skylanders Giants. Aside from the game itself which was launched with either just the Tree Rex Giant figure for owners of the original game or the Portal of Power, Tree Rex Giant, the new Jet Vac and the series 2 Cynder for the XBox 360, PlayStation 3, Wii and Nintendo 3DS, there was a horde of figures released with waves 1 and 2. Not counting Tree Rex, four of the eight new Giants figures have been released. There have also been the releases of series 2 Skylanders (remakes of the original Skylanders), Lightcore Skylanders (classic Skylanders remodeled with pieces that light up when put on the Portal of Power) and of course the new Skylanders made for Skylanders Giants as well. They have also released the first Battle pack three pack which includes Chop Chop 2, Shroom Boom and the Dragonfire Cannon which unlocks a new Combat Arena. 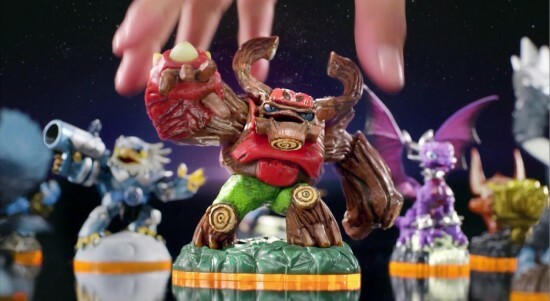 Not since Pokemon has a “gotta get ’em all” mentality hit gaming like it has with Skylanders. Shipments would hit stores and be gone within a few short days. And when someone had finally gotten all the new characters for themselves or their kid, the next wave would hit. And come October, we get to do it all over again. When Skylanders Giants was announced, details were still a little unclear as to how the classic Skylanders would fit into this new game world. Even more questions arose when the new Skylanders Starter Pack was revealed. Would players of the original need to purchase another Portal of Power and a repeat Cinder Skylander to get to play Skylanders Giants? With this latest features trailer (seen after the jump) we get all the important facts. First off, the Starter Pack will be available for the Wii, Wii U, XBox 360, PlayStation 3 and Nintendo 3DS and will retail for $79.99. It will include Skylanders Giants, the Portal of Power, one Giant, one New Skylander and one Series 2 Skylander. With Skylanders Giants fast approaching in time for the holiday season, it is time for the team at Vicarious Visions to start letting us get a peek at some new Skylanders. After the E3 trailer though, things have been a little on the quiet side. Now, with just a few months before the expected October release date, we get the first character trailer of the new lightcore powered giant Skylander, Swarm. After the initial announcement of Skylanders: Spyro’s Adventure, there was mention of a mobile app in development alongside the proper console release. Just how the game’s plethora of characters and technology would tie between consoles, PC and Apple’s iOS was quickly debated by the toy and gaming communities. Once Skylanders: Spyro’s Adventure was released, players were welcomed into two separate but interconnected worlds where their figures gained life both in a classic adventure style game on consoles and the minigame-centric PC community. Now, using those same unique character codes, players can import their Skylander into their iPhone, iPad or iPod touch with Skylanders: Cloud Patrol. Skylanders: Cloud Patrol is a shooting gallery style game with some inspirations from Fruit Ninja. Players take their Skylander, with the ability to unlock more through either gameplay or redeeming codes from purchased figures, and target the trolls that have escaped into the Skylands. Players group together shots to release combos while avoiding hitting bombs which end the game for them. At only 99 cents, Cloud Patrol is the cheapest addition to the Skylanders library for any player and provides a simple but fun burst of entertainment while utilizing characters players have already become familiar with. Check out the gallery of screen shots for Skylanders: Cloud Patrol for iPod touch, iPhone and iPad after the jump. Even though things are ramping up for Skylanders: Giants which is expected this fall, things aren’t slowing down for the Skylanders: Spyro’s Adventure releases. This new wave features two new individual characters Lightning Rod and Zook and a new Adventure Pack called the Dragon’s Peek and featuring the Skylander Sunburn. Lightning Rod looks to be a play off of Zeus, with a burly beard and the ability to shoot lighting at enemies. Zook looks like some sort of mutant vegetable tree hybrid with quite possibly the coolest weapon to be added to the game yet with a rocket launcher along with his ability to drop cover to hid behind as well. The Dragon’s Peek Adventure pack adds an additional level to the game as well as the Sunburn character which is half dragon and half phoenix. Check out the profiles and videos below of all three new Skylanders in action coming to Skylanders: Spyro’s Adventure and stay tuned for more on Skylanders: Giants as it becomes available.